Or at least, that’s what the BC NDP Fundraisers are telling me. If they raise $3 million or so to fight the BC Liberals, they won’t be needed anymore. So, I figure I should help them fulfill their death job-loss wish. Help support the rise of the BC NDP to government today and get rid of the BC Liberals by donating here. Of course, many of you either live outside of BC and would prefer to focus on your own regions and/or don’t have that much money. That’s alright: just simply donate $5 or $10 or so. Every bit counts. Think of it as buying NBCD a drink or something (or if you hate me, throwing said drink into face). Or proving that Internet fundraisers can work for Canada’s NDP. Why would we want to get get of the BC Liberals? Simple: they have the ability to mismanage the province of BC greatly. When it comes to turning surpluses into massive deficits, break their promises to not sell BC Rail then mismanage the bidding process, mishandle their mega projects, fail to give the resources needed to attack gangs, and generally not giving a darn about working people, the BC Liberals have done it all! Now, you might want to focus your money to some winning campaigns within BC. To that end, I’d like you to think about directing your donation to the Tobias Lawrence and Julie Carew campaigns in Prince George. They have a very good shot at getting rid of Pat Bell, the Forest Minister presiding over the massive downturn in the forest industry (this started before the current global downturn) and Shirley Bond, the Education Minister and Deputy Premier that has presided over cuts to both our school and post-secondary system, respectively. *Joking. Please Don’t Hurt Me. It looks like the BC Liberals are under fire because they are planning to make cutbacks to the crime protection budget, reducing the amount of people involved in crime protection. But I don’t know why the BC NDP is hammering the BC Liberals on this; after all, it is totally possible to provide better protection against crime with less. Volia! 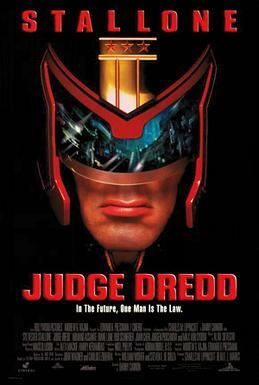 Better crime protection, at lower cost. Guess all the BC NDP wants is a bloated crime protection model. 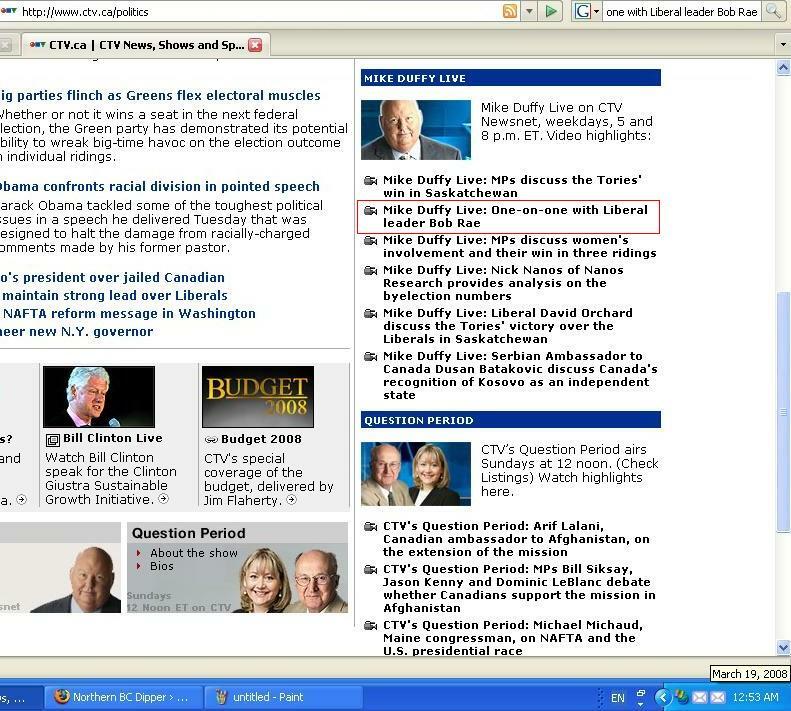 Many bloggers have been discussing the first quarter political party contribution results from Elections Canada. However, what I have not see discussed on any of the blogs that I have read is a big picture view that examines previous quarters. 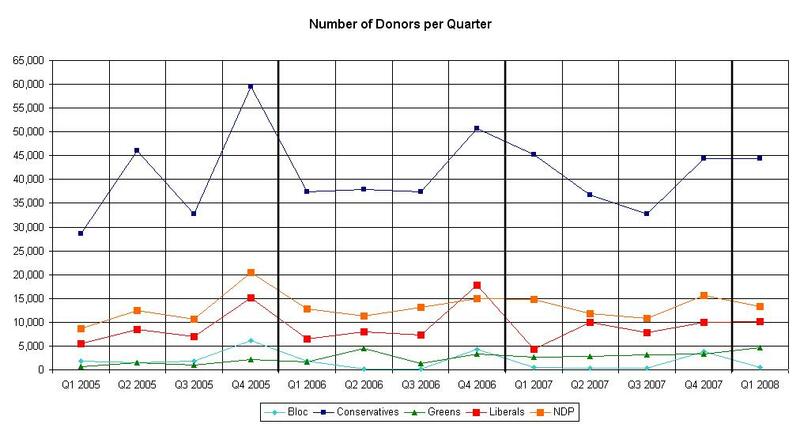 So, with that in mind, I have gathered information on contribution results from First Quarter 2005 to First Quarter 2008 and made three graphs: one on dollars contributed, one on the number of donors, and one on average amount of money per donor. At the bottom, I’ve placed some notes in regards to understanding the graphs. I’ll for the most part leave it to others to come up with their own conclusions and explanations (and/or spin). Conservatives might not want to trust too much in these numbers, as they are from Elections Canada. In the final quarter of every year, there tends to be a increase of contributions gathered. This probably is because donors want to ensure they get a tax credit for the next year. The large rise on all graphs in Fourth Quarter 2005 probably arises from the 2006 Federal Election going on at the time. 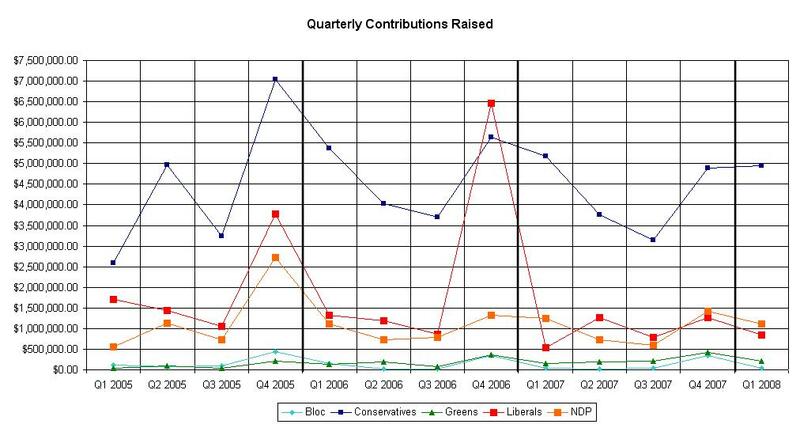 The large rise on all graphs for the Liberals in Fourth Quarter 2006 probably arises from the Liberal Leadership Convention. 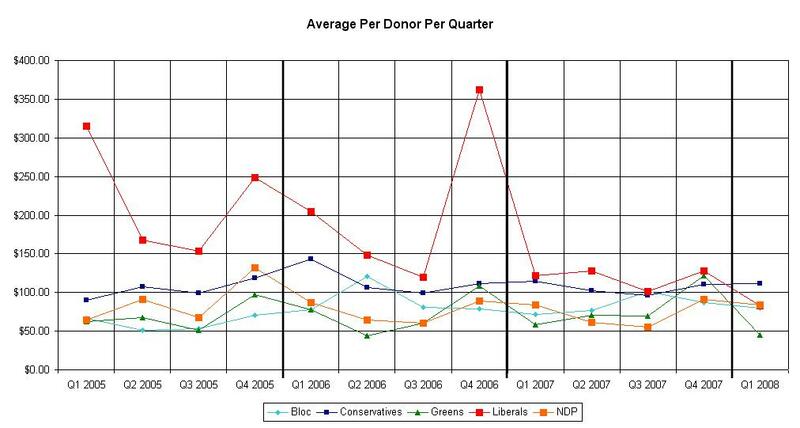 There seems to be a downward trend for the Liberals in regards in average per donor per quarter. Are the Liberals just adjusting to the general range exhibited by the other parties, or is there something else going on?